A 2015 Chevy Silverado LTZ Kirkland Signature Edition for "Costco members only" sounds like a (pretty awesome) prank. But Chevrolet has confirmed they are indeed working with your favorite purveyor of enormous everything to co-brand a limited run truck. Because America! ...? From these PowerPoint slides sent our way anonymously, the truck will apparently be based on LTZ luxury or Z-71 Off-Road packaged vehicles in a configuration "best compared to (top of the range) High Country." As you can see it pretty much looks like every other special edition Silverado we've seen this year: Black wheels, black bowtie badge. Looks like 400 will be built "for warehouse display" with customers having to special-order their own through dealerships. I know, I didn't think it was legit either... but Chevy knew exactly what I was talking about when I rang 'em up and said this is happening in some form or another "sometime around Spring or Summer." Putting the Kirkland Signature stamp on a limited-run luxury vehicle makes about as much sense as mixing 50-year-old Macallan scotch with RC Cola. A Costco truck should be a bottom-trim worker with six doors, rubber floormats, and a longbed, right? The brand's (unofficial) slogan is quantity over quality! And joking aside, that seems like something they should have leveraged instead of creating another bloated luxobarge. 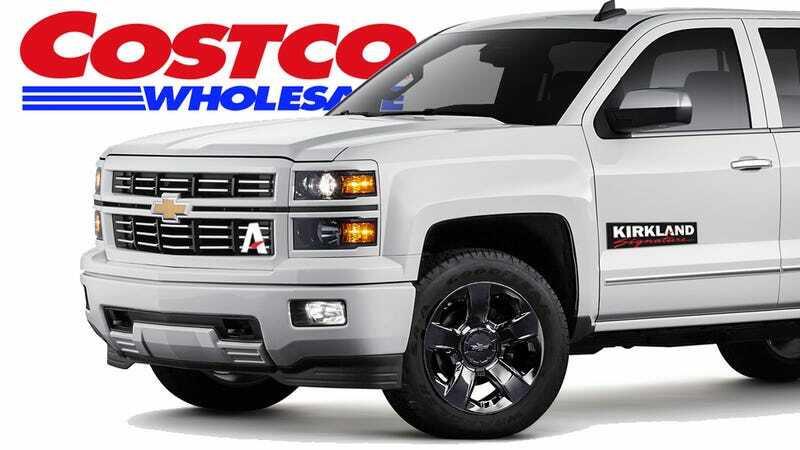 Based on the price of a Silverado High Country (a nice truck, to be sure) I guess the Kirkland Signature Silverado would start around fifty grand, minus the "$400 or $600 Costco Cash Card" you're eligible for on their "GS/Bus or Exec" membership plans respectively. There have been no official announcements on this yet beyond verbal confirmation with Chevy. We have a line out to Costco as well but haven't heard back. Though possibly relatedly, if you search for a vehicle on the Costco Auto Program car buying site right now the default lookup is for a 1500 Silverado. Image by the author, let's call it an "artist's rendition" albeit a poor one.